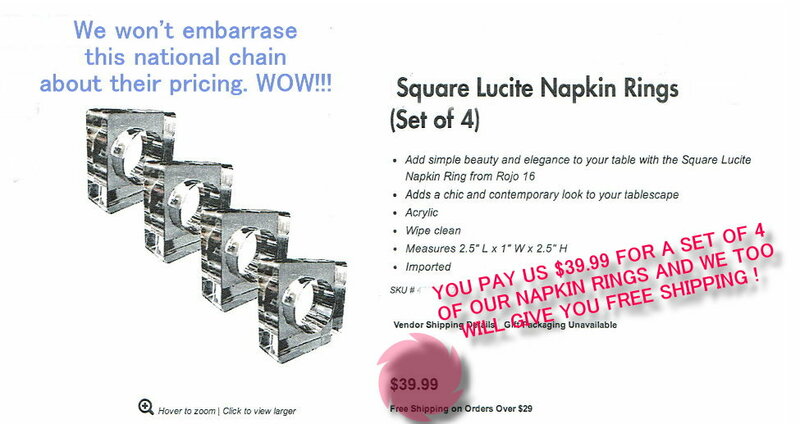 SQUARE ACRYLIC NAPKIN RINGS. These 6 tiny treasures (just $2.99 each) will help make any event a special function. Wedding planners love them and events go on every day with them. Personalizing these useful rings adds a touch of elegance by adding semi-precious colorful stones. Mount them on paper Mache art, colorful metal or stone or personalize even more by hand-painting, laser engraving or using a vinyl applique to promote the occasion or event. Optionally packaged in greater quantity volumes saves you even more. Actual size of each ring is approximately 2.25" Sq. x 1" thick. Dimensions shown above right reflect the packed contents of this 6-Pack for shipping. Want to see how we beat the competition's prices? Click here. Although acrylic compounds are tough as nails when it comes to durability, their life can be shortened if not taken care of properly while cleaning. Acrylic products do not go into any commercial or home dishwasher, rather, simply hand wash in warm water using liquid soap, rinse and then pat dry. That's it! No scrubbing, no scouring no abrasive cleaning agents or solvents required. Its easier on the products and you. Only a very few acrylic products are made for commercial dishwashers and we will tell you which (if any) such items we have on their respective product page. Acrylic is not meant for microwave use at all. All weights and measurements are as accurate as possible and may include some outside packaging or boxing used in shipping in order to accurately calculate shipping weights and costs associated with such. For all of our higher volume users, if there is a quantity not shown on any product in which you have an interest please do not hesitate to contact us immediately. We will gladly provide you a non-published rate if available based upon current pricing, availability of product or other influences that may effect any additional discounts. Please e-mail info@AcrylicGiftware.Com or call us at (972) 345-0472. Bulk is a term used to describe items that are collectively packed in one carton from the manufacturing plant to us. Once in our warehouse, and as customer orders dictate, these items are selected, re-packed in the quantities that individual customer orders require and shipped. Some of our products already come pre-packaged in various quantities (6, 12 etc.) and we note these where possible as we do for those few items that are gift boxed. Due to manufacturing demands,the shipping container sizes, volumes and pre-boxing may change without notice. Unless specified otherwise, all orders are shipped "Ground" whether by FedEx, UPS or the United States Postal Service's Priority Mail, whichever is the quickest method out our door to you. Other, more immediate and optional, methods of transportation are available at time of "Check Out".